Brisas del Palmar was formed in Santiago, Cuba, by brothers Rosel and Yordanis Lamoru in 1999, with Rosel as arranger, composer and guitarist. The band is a vital part of the "Grupo 450", a prestigious catalogue at the Cuban Institute of Music of the best Cuban music groups in the Province of Santiago de Cuba. 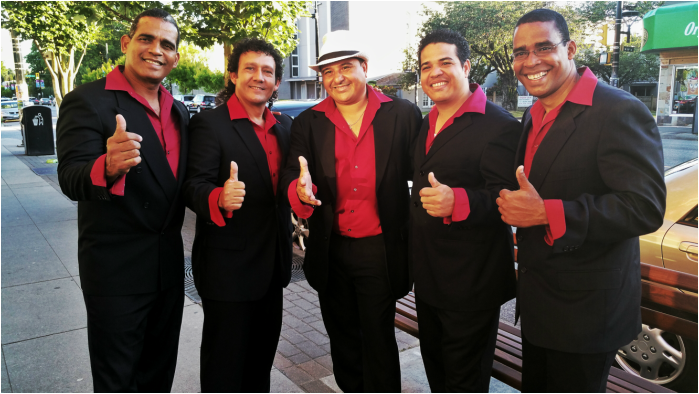 What makes Brisas del Palmar unique is their ability to arrange and perform as well as to harmonize their four voices to produce a sound that is captivating to all audiences. Brisas del Palmar is known in Cuba as one of the leading bands of traditional music. They won special recognition at the 2000 International Festival of Boleros in Santiago de Cuba. They placed second in the 2001 Festival of Singers of the Americas, held in Guantanamo, Cuba (a competition of ensembles from all over Cuba, Mexico, Central and South America). In 2002 at the same festival they were honoured with the award for the best new group in the Americas. Brisas del Palmar is featured daily on Radio Taino, the national tourism radio station of Cuba. Brisas del Palmar performed regularly at the “Bodeguita del Medio”, the Havana bar made famous by Ernest Hemingway, now the most important music venue in Havana. They have toured British Columbia and Alberta since 2003, playing to enthusiastic crowds at music festivals and summer concerts. In 2012, they represented Cuba in the First Cultural Encounter in El Salvador.